I was really excited way back in April to be asked to be one of the faces of the "Styled By You" spring/summer campaign for the Fort Shopping Park in Birmingham. 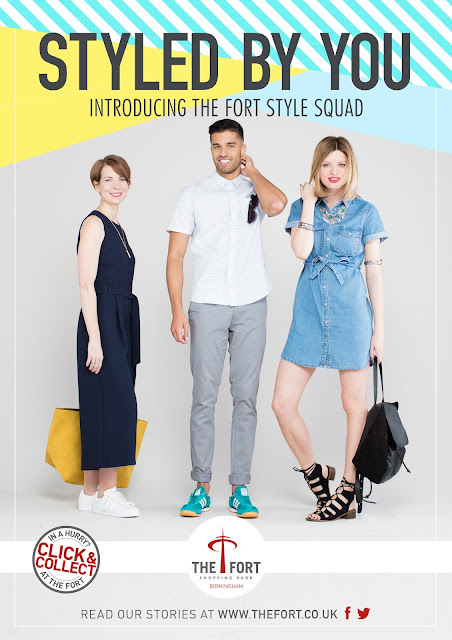 The idea behind the campaign was that three fashion specialists would be chosen to form the Fort Style Squad, to help inform and inspire Fort Shoppers to update their look for the summer months. My Partners in crime were model Tom King (you may recognise him from the TV) and local blogger Sophie Neal, who edits the blog Sophie etc . In my role as an Ambassador, I will be hosting a twitter take over one Friday lunchtime in July, as well as contributing to features for the media. I've written about the outfit that I wore previously but looking back now all that I feel when I think about the day that I chose it, is pain! It was the day after the London Marathon and the only way that I could walk down the stairs in the marketing suite was to use the handrails and pretty much swing down them like a monkey. But the walking around the Fort was good for me and I loved the outfit that I got to wear for the photo shoot a couple of days later - the Culotte Jumpsuit from Warehouse (£59) and Adidas Stan Smith trainers from Schuh (£56.99). 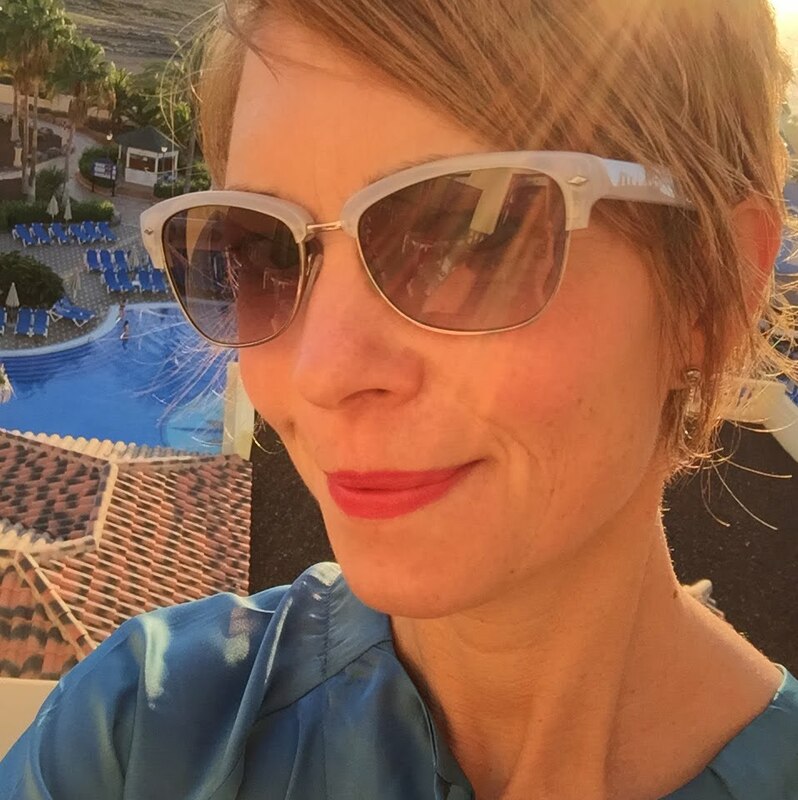 The latest news and style tips from "the Style Squad" can be found on the Fort's social platforms - twitter and facebook, so do drop by for a look sometime. "Blush" is a big trend for both clothing and interiors right now and for my second day working with M&S last week, I chose an outfit in blush tones. Both the sprig printed blouse (£35) and the trousers (£45) were from Per Una. I wore a short length in the trousers so that I got the slightly cropped look that I was after. The shoes were from Autograph (£55) and they were incredibly comfortable. They were made of a very soft suede and also had insolia padding, so they weren't hurting even after 7 hours or so of wearing them. I don't know if you can see but the shirt is made up of lots of tiny pleats around the torso so it has a nice fit to it. No ballooning but no clinging either! Apologies for not blogging more regularly at the moment. My usual 9 pm slot for blogging seems to have been swallowed up with other activities of late - although I must admit I'm not really sure what. The work on the house is due to finish on Friday so it's been a bit of a whirl of last minute decisions but I think that we are getting there. I've got lots to share for anyone who is interested once it's all done - from paint colours to flooring, furniture, lighting and accessories so do keep a look out. Friday sees me in the Exeter store so hopefully I will see some of you there. In the meantime, keep dry! The girls went for it on Friday. It was a case of pleats, blouses and bling all the way for me and my 8 year old photographer, who was appearing in her school assembly as a beauty queen. Did she have a lot to say? No. Did she mind? Hec no - for she was dressed in bling head to toe. That's my girl! As soon as I put my shorts on this morning the sun went in - which says it all really. But having got that far, I persevered and kept them on well - just because..... Just because I didn't get around to changing, just because it was warm enough to keep them on, just because I like them and just because I felt like flying the flag for all 46 year olds who want to wear shorts! But there is always that dilemma of what to wear them with. If we lived by the sea, or if it was a day in the garden it would be a boho top and flip flops all the way. But as I needed to go into town and do a hundred and one other jobs locally, I didn't want to look as though I was about to chuck my bucket and spade into the car and head to the nearest beach for an ice cream. 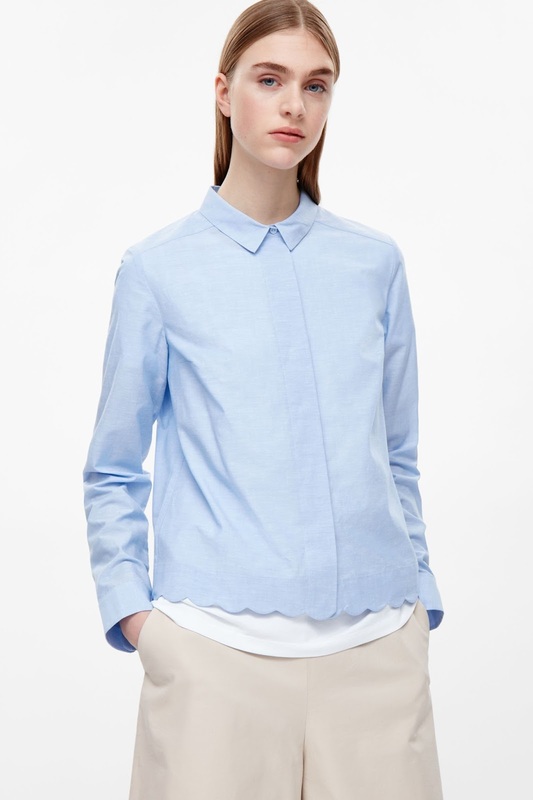 So I felt that this shirt with a scalloped hem from Cos (£45) would add just a little bit of structure and tailoring to my look. Well, insofar as I ever really think about these things. And that was it really. I also wore this shirt for a night out on Friday with black fitted trousers and big ear-rings and I have other plans for it too. I just love a good shirt for the summer!